Townhouse in Regina Gardens complex. WiFi and TV package included. Our townhouse provides the ideal setting for a relaxing family holiday with amenities very close at hand. The house is situated in the much sort after Regina Gardens complex. It sits to the edge of the pool and has a shaded garden from which the pool can be easily observed. There are a further 3 pools on the complex, one of which is a children's pool, all of which can be used by residents. There is a kiosk directly outside the front of the complex and a snack bar directly outside the back. The house consists of open plan living room, dining area and kitchen with air conditioning and fans. One of the two settees can be pulled out to use as a sofa bed. There is complementary Wifi, British TV and a huge selection of films via an Android box, a DVD player, CD player, and an Xbox 360. The lounge cupboard contains a large selection of books including lots of information about Cyprus. The kitchen is fully equipped with cooker, hob, fridge freezer, microwave, toaster, kettle, washing machine, crockery, cooking equipment and utensils. There is a dining area which seats 6, and a downstairs toilet and shower room. There is outdoor seating to the front of the house, and a patio to the rear with table and chairs, and a overhead fan for those extra hot times. We have our own sunbeds, a BBQ and a selection of pool toys. Upstairs consists of 2 bedrooms, each with 2 comfy single beds which can be pushed together. The front bedroom has a further pull-out bed suitable for an extra child. There is plenty of wardrobe and drawer space, plus shutters in each bedroom which give complete blackout to help you sleep through the bright Cypriot early morning sunshine. Each bedroom has aircon as well as room and ceiling fans, as does the living area. The bathroom has a shower over a bath as well as sink unit and toilet. The shower is operated by a pump which means that it is powerful, and there is both solar and immersion heating for water. All windows and door are fitted with fly screens to allow the house to be cooled without fear of insects getting inside. The pool on our part of the complex is of varying depths. There are sunbeds and umbrellas for communal use. The house and pool are set in well maintained gardens. The Tomb of the Kings area is a bustling but family orientated part of Paphos with a huge selection of bars and restaurants within easy walking distance (10 minutes walk). There is also a bar which serves food and stays open late on the actual complex. The nearest supermarket is 7 minutes walk. Whilst the nearest beach is just 9 minutes walk. There are a selection of other reachable beaches, plus a small waterpark in the nearby King Evelathon hotel to visit. Paphos has a guaranteed climate for at least 9 months of the year. We have never experienced rain in the Summer months, and have walked on the beach in T-shirts and shorts on New Year's Day. There are several beaches to choose from such as Kato Paphos, Coral Bay, Lighthouse beach, Sandy beach and Venus beach. There are many spectacular churches and monasteries which you can visit. There are also archaeological sites in abundance including the Tomb of the Kings, and the spectacular Kurion. There are many wineries which do tastings and tours and the well- known Aphrodite's birthplace. Just down a small hill from the complex is the Tomb of the Kings Avenue which runs from one end of Paphos to the other and is serviced by frequent buses. Travel to the left all the way past the modern Kings shopping mall, onto Paphos harbour with its array of restaurants, bar street for later nights out, and Paphos fort. Travel in the opposite direction to the resort of Coral Bay with its huge sandy beach. Bus fares are currently 1.80 Euro per journey of any distance. Other local attractions include watersports, the bird centre, Paphos Zoo, waterparks, Segway tours, Escape rooms, Footgolf, Pitch and Put and well as a variety of local markets. There is plenty to see and do. For golfing enthusiasts there are at least 3 courses that can be accessed: Minith Hills, Secret Valley and Aphrodite Hills. For walkers, hikers, cyclists there are safe recognised routes along the beach front and uptowards the Akamas Peninsula and the Troodos Mountains (which are ideal for Winter skiing). Trips can easily be booked along the Tomb of the Kings road, and cars can be hired relatively cheaply. The complex is 20 minutes drive from Paphos airport. A taxi fare is generally about 25 Euros. EasyJet, Ryanair, Tui and Jet2 all fly into there. It is also possible to fly into Limassol and travel to the house. The house is our holiday home and we adore it. We have also fallen in love with Cyprus and particularly Paphos over the years. We will do our best to answer any questions and queries to make your holiday as enjoyable as ours have been. We will do long term stays at a discounted rate - please ask. Returning clients get 5% discount. A one off cleaning fee of 56 Euros for 2 people and 6 Euros per each extra person is payable to Ronnie our housekeeper, who lives on another part of the complex and is on hand. A refundable security deposit is extra to rental fees. 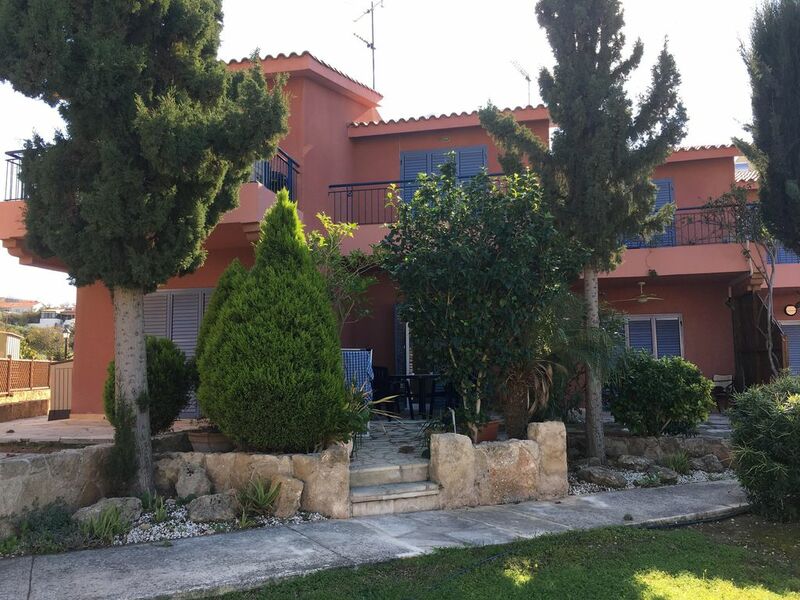 Having holidayed in Paphos several times and fallen in love with Cyprus, we wanted to buy a property here where we could spend our future holidays, and one day retire to. This is our holiday home and we adore it. We are very excited to be starting on this new venture, and really hope that you love it as much as we do. Having looked at several properties in the Paphos area we were very much certain of what we wanted to buy for ourselves. The area was crucial - the Tomb of the Kings area has everything that we want within walking distance. We also wanted a house rather than an apartment, and were very lucky to find one that had been so beautifully looked after and maintained by the previous owners. The high standard of fittings and extras such as fly screens, power shower, well fitting shutters was also a selling point for us. Although this is our holiday home which we have equipped with just about everything we can think of, we remove personal items so that you can think of it as your home for the duration of your stay. toilet, combination tub/shower, Power shower. Downstairs unit, plus units in each bedroom. Through the air conditioning unit. With built in tumble dryer. Plenty of parking directly outside the front door. 2 settees - one of which is a bed settee plus throws. Tables and lamps. Sideboard containing books. Large dining table with 6 chairs. A wide range of terrestrial, Sky channels and options to view Middle Eastern channels via an Android box, which also features a vast selection of recent film titles. A varied selection from which you are welcome to swap. Buckets, spades, pool toys, body board, inflatables. Xbox 360 and a selection of games available. Pots, plants, shrubs and outdoor lighting. Upstairs balcony from bedroom 1 with views over the pool. Furnished with table and 2 chairs. With table, 4 chairs and ceiling fan. There are at least 3 local golf courses at Minith Hills, Secret Valley and Aphrodite Hills. Large communal pool directly outside of the back of the property with varying depths. There are a further 3 pools on the complex, including a children's pool which may also be used.